Bourn Mill is a type of mill called an 'open trestle post mill'. With the weight of the body, or 'buck' supported on a central post which is in turn supported by a trestle. 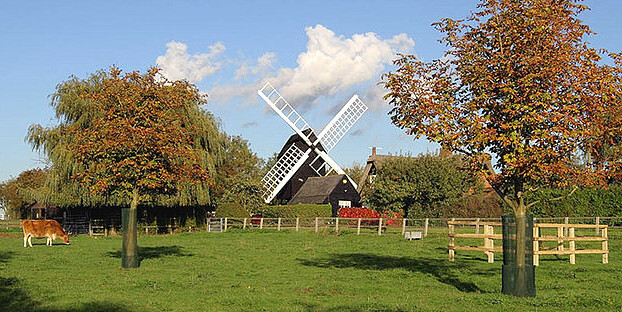 The earliest record we have of the mill is from 1636, but it may be much earlier as this type of windmill has hardly changed since the 13th century. The buck has two floors. The upper stone floor contains the grinding stones which rotate against each other to grind grain. The upper or runner stone is turned by energy provided by the sails. Grain is poured from a hopper into the gap between the stones and is ground into flour. A chute carries the flour down into the meal bins on the lower floor. The sails have to face squarely into the wind and in order to achieve this the whole body of the mill, with all the machinery inside has to be rotated around the central post using the tail pole. To stop the sails, the mill must be turned again so that they are 'on edge' to the wind. It cannot be allowed to go too fast or the friction between wooden pieces can cause heat and fire to break out. A detailed sketch or drawing of the working of this is on the Cambridge preservation society website, but too small to see well. The Mill is located between Bourn & Caxton. It can be reached by the A428 from Cambridge, via Bourn village or the A1198 Royston to Huntingdon Rd. Via Caxton. Mill is ¾ mile east of Caxton, signposted on open days only. There is a footpath that goes up the farm drive and over the hill, passing within feet of the windmill. There appears on the aerial photo to be a small car park one field west of farm entrance. Open on some special weekends. Outside access may be available at other times. May to September, last Sunday in the month and National Mills Sunday, 14.30 – 17.30. Other times by appointment.